Spain is the new European Champions. 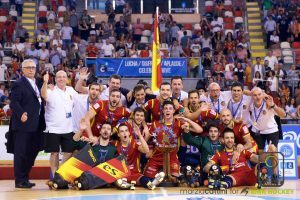 Tonight in A Coruña, in front of more than 3,000 people, the home team obtained its 17th victory in the European Championship, the first after six years of absence from the top of the podium. 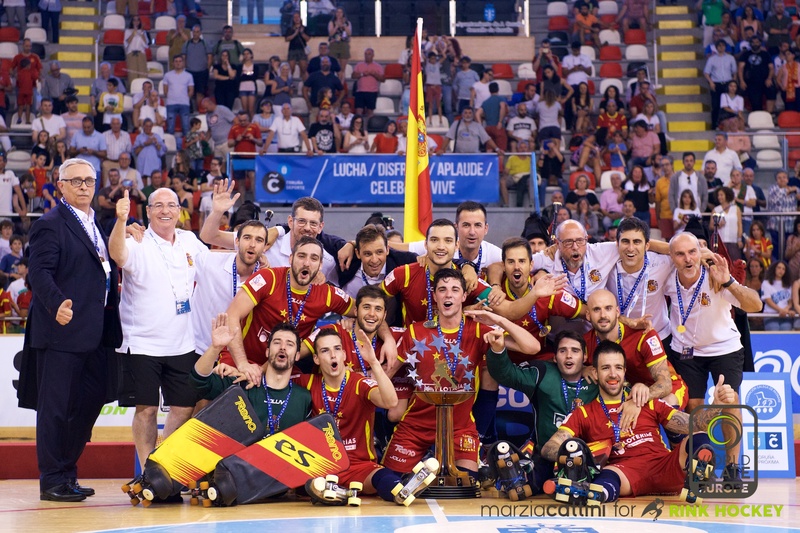 Spain won clearly against Portugal in which can be defined as the “clasico” of the European Rink Hockey. The Final ended 6-3 for Spain. The bronze medal went to Italy that won the Final for the 3rd place 5-2 against France. Spain and Portugal played an amazing game and the two goalies, Fernandez for Spain and Girao for Portugal, had a lot of work to do during all the Final. Portugal began attacking in an incredibly tough way; the rapidity of the Portugues player created many problems to Spanish defenders; in the first minutes of the game, Fernandez saved many times its goal cage. Portugal scored first with Alves, but soon Spain found a way to took control of the match. Adroher sudden tied and, after 10 minutes of the game, Spain went ahead thanks to one of its youngest player, Ferran Font. A violent shot of Lamas fixed the result to 3-1 before halftime. In the 2nd half, Spain completed the job with two points in a couple of minutes and, once again, with two young players: Ignazio Alabart and Nil Roca. The last opportunity for Portugal passed at the 12th minute when a blue card to Bargallo and then the 10th foul of Spain gave Portugal two direct hits: Alves score the first, but Rodrigues failed the second. A few minutes later, Font scored the 6-2, closing the game. The last goal for Portugal was by Joao Rodrigues, best scorer of the Championship, while the Riazor was already celebrating the new European Champions. Please, find all the pictures of the day at this link. All the pictures are free to use but the credits “Marzia Cattini for WSEurope Rink Hockey” is compulsory. Next article[ITALY] Italia di bronzo. Europeo d’oro. [ITALY] Italia di bronzo. Europeo d’oro.